For years Juniper has been passing out these stickers in various form factors proclaiming, I Wish This Ran Junos. I’ve saved one of every type I ever layer my hands on for my home office desk collection pictured here. Now this whimsy is coming true. Juniper’s CEO announced a commitment to disaggregating Junos from the hardware and selling software only for white box deploy. Juniper already introduced a white box data center switch this year where you could remove Junos and run open network operating systems. They intend to carry this forward onto all Junos platforms going forward. 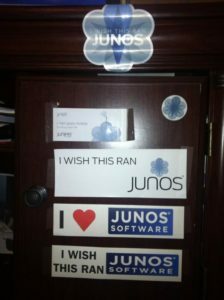 You will no longer have to run Junos on Juniper hardware. Thus Wish This Ran Junos will finally come to pass. Juniper also notes with this announcement that the vast majority of their engineering resources are in software development and not hardware design. The maturity of the specialized chip market for networking has freed up companies like Juniper to concentrate on the truly difficult and specialized problems of networking in hardware. Much of the base material for speeds and feeds can be delivered by commodity silicon with the cost shared by the entire industry instead of carried by a smaller user base. This model for disaggregation will also assist in the software development cycle. The looser connection of software to hardware will make Junos even more portable. And allow hardware designers at Juniper to worry less about hardware/software interaction. This will potentially speed the development process. Juniper makes wonderful high quality hardware. This is especially true in products requiring high performance specifications. The MX series for example, has made core networks at service providers highly reliable, redundant and with large capacity. For these applications the money spent on top notch hardware is well worth the expense. But there are many other areas of the network where special environmental conditions or very low cost hardware solutions are what is required. To date we have to leave the Juniper portfolio to fill these needs. But now disaggregation may afford us opportunities to use white box routers at customer sites where cost is an issue but keep the Junos we know and love still running the show. I’ll be watching the development of Juniper as a software company closely.